California West is proud to introduce a limited collection of 19 new, estate-style residential retreats for a select few families. 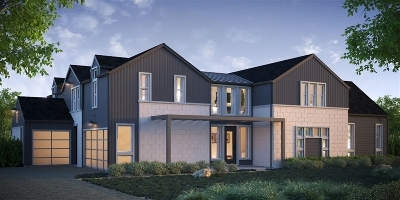 Encinitas Enclave will offer an experience that showcases the best of coastal living, both through the thoughtful architecture of the homes and the picturesque natural terrain of the surrounding Encinitas hills and lifestyle. 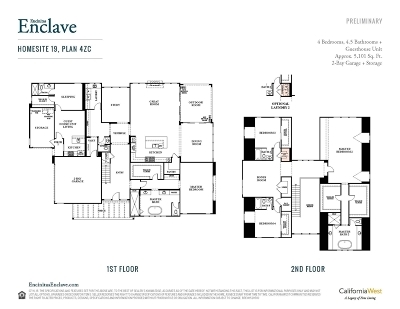 This Plan 4ZC on Homesite 19 features 4 bedrooms, 4.5 bathrooms, bonus room, study, attached guesthouse, and outdoor living., This Modern Farmhouse Style residence features a first floor master suite with an expansive dual master on the second floor. This culinary kitchen includes Thermador stainless steel appliances including 30" convection wall oven, 48" Professional series Pro style six burner with griddle, 48" Chimney wall hood, microwave, dishwasher and countertops. Enjoy the expansive outdoor living area with LaCantina bi-fold doors at both great room and dining room. This residence also includes a private attached guesthouse with separate sleeping room with full bath, walk-in closet, and kitchenette. FOUNDATION JUST POURED, ALL OPTIONS AND UPGRADES CAN BE CHOSEN BY HOMEBUYER!!! Home completion will be late summer. *Specifications and features set above are to the best of the sellers knowledge, accurate as of the date hereof. Notwithstanding this fact, this listing is for informational purposes only and may not list all options, upgrades or decorator items. Seller reserves the right to change specification of features and upgrades included in this home, as necessary for time to time. Photos/virtual tours are of model home or renderings which are for artist conception only, not actual house. 2 CAR Garage is subject to vehicle specifications/size. Broker referral to be paid at flat fee of $35,000.